Are you looking to play fútbol sala in Barcelona? At CeleBreak, we make it possible for anyone in the city, from locals to tourists, to play fútbol sala. In a city as big as Barcelona, the opportunities to play football are endless. From regular pick-up sessions to competitive leagues and now futsal, CeleBreak offers the accessible to play football without commitments to a team’s schedule. Just whenever suits you! We welcome all levels of play at our matches and one of our dedicated organisers will welcome you to our community and play with you on the pitch! We arrange the pitch, bibs, balls and create the teams. Therefore, all you need to do is sign up on the CeleBreak app and be at the pitch ready to play! Organising a full game of football is often very challenging for both locals and tourists; it requires finding enough people to play, setting a time when everyone is free, and finding an available pitch. Luckily, at CeleBreak, we take care of all those problems for you. All you have to do is show up and have fun! If you are looking to play in a game of stress-free football in Barcelona, CeleBreak is the way to go! 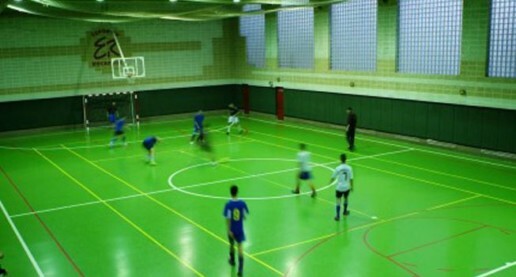 Sant Antoni is a new location for futsal, so make sure to check the app for dates and times. Our field is located at Esportiu Rocafort, Carrer de Floridablanca 41, , 08015 Barcelona. CeleBreak started from the idea of wanting to play football, but not knowing who, where, or when to play. We have resolved these problems. Our goal is for you to enjoy soccer whenever and wherever you can. So join today and become a part of the worldwide community!